Whether you buy our vegetables at the farmer's market or at our farm gate, you can be sure that they've been out of the field for hours - not days. Because we pick, wash, and package our vegetables by hand, we minimize the damage done to leaves and skins that shortens shelf-life and ruins flavour. Our vegetables are never treated with synthetic fertilizers, herbicides, or pesticides. We use the same methods as certified organic farmers - and in three years, we'll be certified, too. every vegetable is a small wonder with a big taste. Looking east at our farm in July. 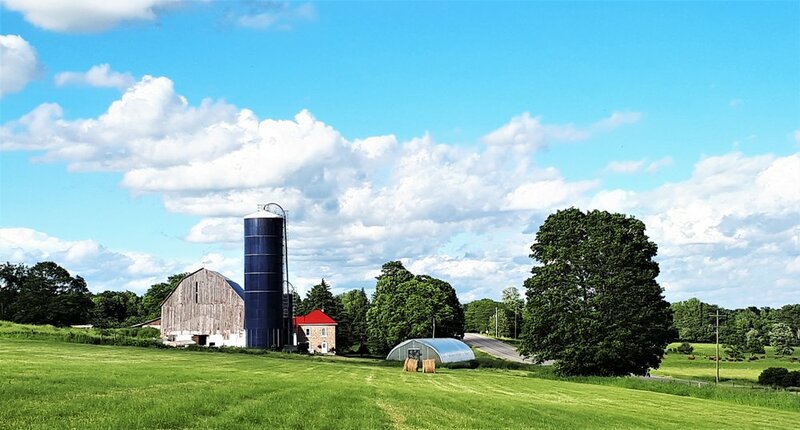 our land outside athens, ontario, has been farmed since 1797. The Crown deeded the eastern half to Jacob Brown, a farmer and a smuggler of potash, of all things. Joseph Jessup was granted the western side, most likely as a reward for fighting Americans in 1776. Since then, the farm has passed through many hands - the Judsons, Steacys, Greens, Washburns, Bouwers, Reuvers, Kemps, and, most recently, Nylands - who grew grain and corn and raised beef and dairy cows. Our main field, ploughed and ready for planting. 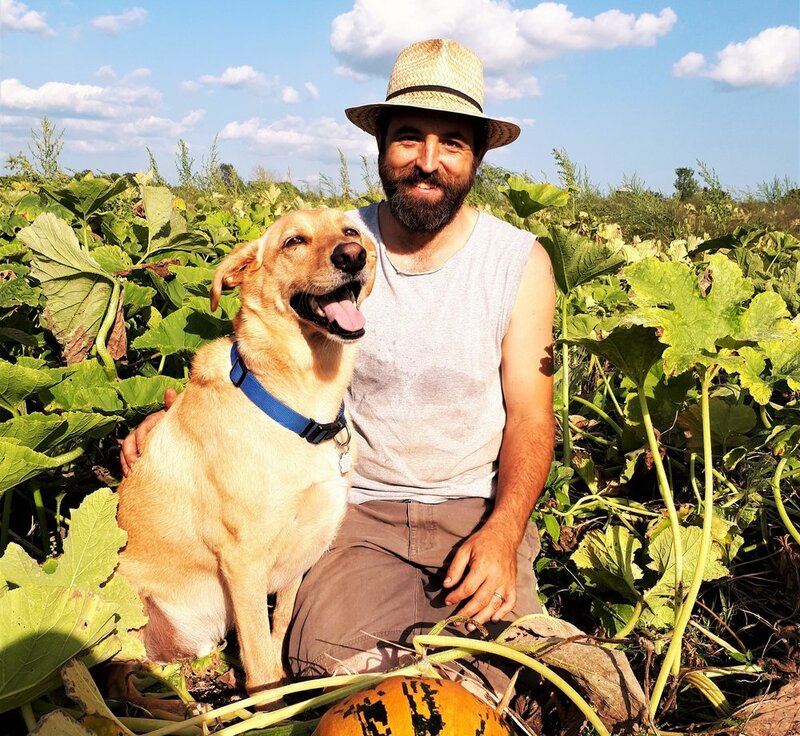 John in the pumpkin patch with Onion, our happy yellow dog. Melissa with some lacinato and white Russian kale. John, who was born and raised in Ontario, moved to the US for graduate school and stayed there for fifteen years. He taught history and literature at Harvard University for awhile, and then moved to the University of Mississippi to work as a history professor. Melissa's education took her from her native Wisconsin to Massachusetts, where she studied and taught German at the University of Massachusetts, Smith College, and Mount Holyoke College, among others. We were introduced to organic farming in the summer of 2007 when, eager for a change of pace, we travelled through Nova Scotia as volunteer farmhands. That was it: we knew from then on that we wanted to farm. Melissa built her skills at Red Fire Farm, the largest organic farm in Massachusetts, and later started her own small farm in Mississippi, Mudline Farms. When our daughter Lulu came along in 2016, we knew it was time for a change. John's parents, Wayne and Emely Bennett, had fond memories of farm life from their childhoods. They loved the idea of retiring to a farm that John and Melissa would work, and they agreed to sell their house in the Toronto suburbs. In June 2016, we all moved to Bramble Lea Farm. The old dairy barn, with neighbour Jim's tedder. 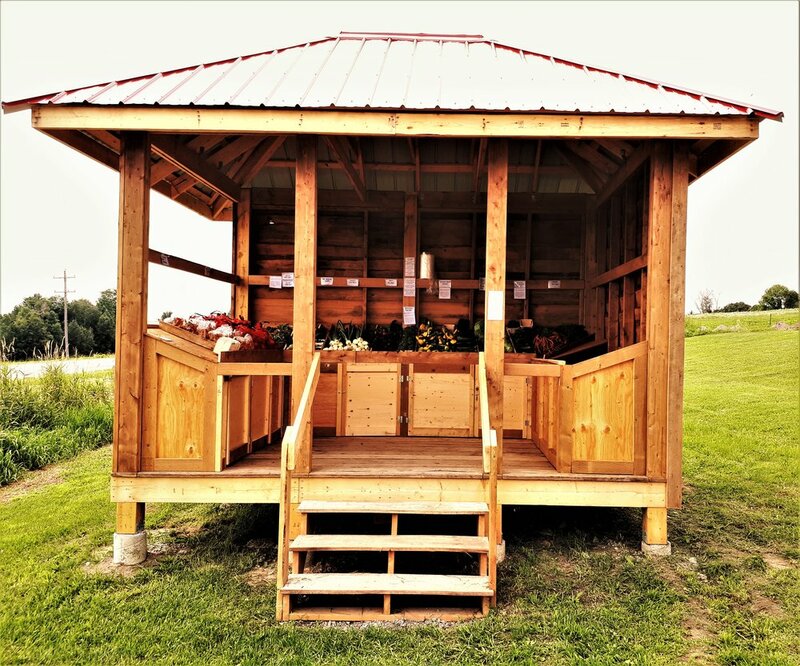 Our farm stand on County Road 42. You can buy vegetables every day at our farm gate outside Athens in the spring, summer, and fall. From June to October, you can visit us at Beechwood Market in Ottawa between 9am and 2pm. Beets for sale at our stand at Beechwood Market. Our customers can buy a membership in our market-style CSA. Like a traditional CSA, your purchase of a membership provides us with the start-up capital we need to put seeds in the ground, diesel in our tractor, and boots on our feet at the beginning of each season. Unlike a traditional CSA, we're not the ones who decide what vegetables you get - you are.